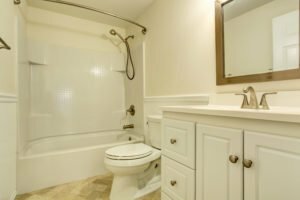 This Is PART-1 Of A 3 Part Article About How To Make Any Bathroom Appear Larger. It is done with decor, not a remodel of the bathroom. Al’s Plumbing, Heating & A/C, in Plano, Texas provides full service plumbing maintenance, repairs and replacements for every plumbing component in your home. Al’s sells and installs Rheem Professional Series gas & electric water heaters, and tankless water heaters. Al’s Plumbing, Heating & A/C is near your home in Plano, Allen, and Frisco. We service all homes in southern Collin and Denton Counties with no additional travel charge. You Can Purchase From Us, OR Buy Your Own + Bring It Home & Call Us To Install. Small bathrooms are common in 1960’s & 1970’s DFW homes. Particularly if you have an older luxury home, a small bathroom poses a challenge that can’t be resolved. Short of a room addition, the only option is to make the bathroom appear larger. This article discusses 50+ ways to visually increase the size of a bathroom. Many are quite practical, others are uncommon. All ideas work together with the end result of having improved the appearance of the bathroom and making it appear larger. Clutter is anything you’re keeping that adds no value to your life. Decluttering is all about making more room for the things that matter while freeing up visual space on counters and other surfaces. Bathrooms are the smallest rooms in the house, and are home to seemingly countless grooming & hygiene products. To make a bathroom look larger, put these items out of sight, or group them together. This does not mean they must become difficult to get to. Dispose of items you don’t use. There are likely items that you tried once and never used it again. While it may seem a shame to throw it away, why keep it? If you didn’t like a new product, or stopped using a product, there is no reason to think you will start using it again. Group like items in a basket or container where you can find them quickly. Put hair dryers & straighteners in a hanging file-folder and install on the side of the vanity or on the wall below the towel rack. Install a recessed (into the wall) Medicine Cabinet when a surface-mount version won’t fit. While we are all familiar with the typical height for medicine cabinet, what’s to stop you from installing a second medicine cabinet above, below or to the side the existing one? Especially with those inset into the wall, proper placement of two or more appears as a larger mirror. If they are stacked, this will enhance the height of the ceiling, which increases the visual-space in the room, and doubles storage. For metal items like tweezers, scissors & nail clippers, add a magnetic strip to the back of a medicine cabinet door. They will be very convenient to get to & be out of sight. And, you’ll never have to dig around in the bottom of a drawer again. This can be done as open storage, or with shallow cabinets designed to be above the toilet (without the risk of banging your head into them). Think upward. Store items that you don’t use often in high places. A shelf over the bathroom door is ideal for backup toiletries and rolls of toilet paper. Most interior doors are 83″ tall (including trim). Ceiling height in most homes is 8 feet (96 inches). This typically allows 13″ above doors for storage. There are countless shelf options for above doors. The one shown is all white coated wire, and is 2 feet wide. Add a shower organizer. It gets hair products off the edges of the bathtub or shower floor, and makes them easy to access with your eyes closed to keep out the water. Floating vanities, or those that are open below, will visually open the space while still covering drains. Bath vanities are around 21″ deep. The stacking storage bins shown below are: 14.25″ Deep / Long X 12″ Wide X 8.5″ Tall. You can double or triple your storage using the same amount of space. If You Need A Shorter Cabinet, The One Below Comes In A Number Of Colors. The FOCAL POINT of a bathroom is typically its most visually-interesting feature. It may be a fixture, an architectural feature (such as a window) or a feature your create, such as an accent wall or tile. If there is no interesting feature, you can create one with decor. One focal point is enough for one visual sight-line. Multiple focal points will compete for the eyes’ attention. This can create a chaotic feeling while in the room. If the room has more than one sight line (such as a divided bathroom, with bathtub & toilet in one area and the vanity in another) each sight-line can support 1 focal point. If the focal point is at the back of the room, it will draw the eyes to it and make the room feel larger. Click On Image To: View Product, See Details, or Purchase From Amazon.com. This Is PART-1 Of A 3 Part Article About How To Make Any Bathroom Appear Larger. Al’s Plumbing, Heating & A/C, in Plano, Texas provides full service plumbing maintenance, repairs and replacements for every plumbing component in your home. Al’s sells and installs Rheem Professional Series gas & electric water heaters, and tankless water heaters. Al’s Plumbing, Heating & A/C is near your home in Richardson, Garland, & northeast Dallas, TX. We service all homes in southern Collin and Denton Counties with no additional travel charge.